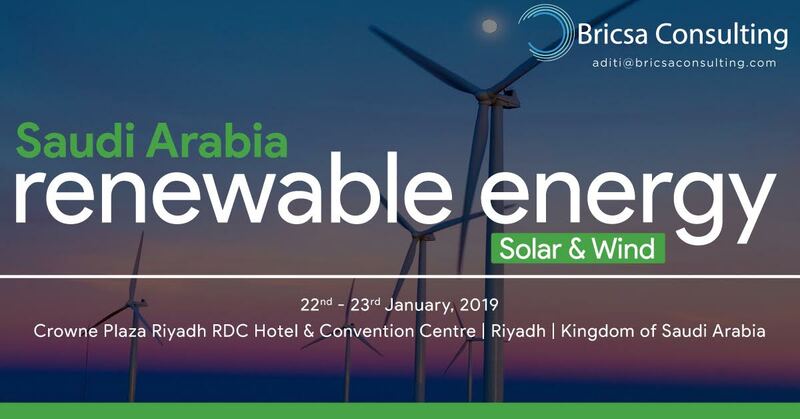 Saudi Arabia Renewable Energy – Solar & Wind 2019is a 2-day conferencethat is being hosted on 22nd– 23rdJanuary 2019at Crowne Plaza Riyadh RDC Hotel & Convention, Riyadh, Saudi Arabia.This conference focuses on the future of Renewable Energy in Saudi Arabia with further discussions about Technological Enhancements, Oman’s Miraah Project, Masdar Initiative, Prospective Development Sites, Electric Vehicle Market, and Dubai Clean Strategy 2050. It also discusses the potential for growth of the Kingdom in regards to reducing Carbon Footprints. It’s a platform to discuss and debate best practices which can be instrumental in maximizing the power sourcing in the region. To download the conference agenda, kindly click here.